The very first bit of anti-libertarian humor I ever posted was this clever video about the anarcho-capitalist paradise of Somalia. I then shared two cartoons, one on libertarian ice fishing and the other showing libertarian lifeguards. That was followed by a very funny list of the 24 types of libertarians. But I haven’t shared anything making fun of people like me since this “think I do” montage last year. Thanks to Buzzfeed, however, we now have something new for our collection. 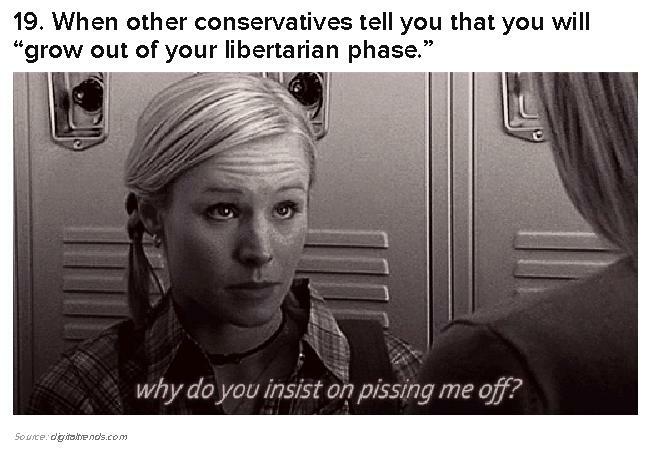 They came up with “23 Libertarian Problems” and here are two of my favorites from the list. Just in case loyal libertarian readers don’t like self-deprecating humor, you can expunge your unhappiness by enjoying some anti-GOP humor here, here, here, and here and some anti-Democrat humor here, here, here, and here. And if you’re still unhappy, cheer up with this libertarian fantasy. 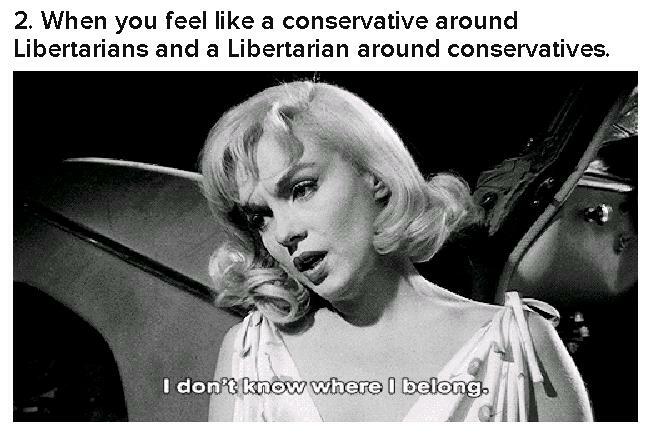 “Other” conservatives? Libertarianism isn’t a variety of conservatism. It has overlap, but it also has overlap with progressivism. It is its own thing. Your Somalia post is not funny. Libertarians have died to bring freedom to Somalia/Somaliland. You should get up to date at http://www.libertarianinternational.org the Libertarian International Organization. It’s headed by the guy who founded the modern movement and conceived CATO as a libertarian-oriented group. That doesn’t mean libertarian ignoramus. What I especially love about this is that it proves libertarians can take a joke, but if you look at the comments section on Buzzfeed it’s obvious that no one else can. Mention libertarianism and everyone loses their minds. LOL – I love it, funny and insightful! on August 2, 2013 at 9:15 am Www.